The first GW4 3Rs Symposium on Thursday 6 December brought together researchers and animal technologists to showcase the excellent 3Rs-related research taking place across the Alliance and highlight resources and funding opportunities available from the NC3Rs. 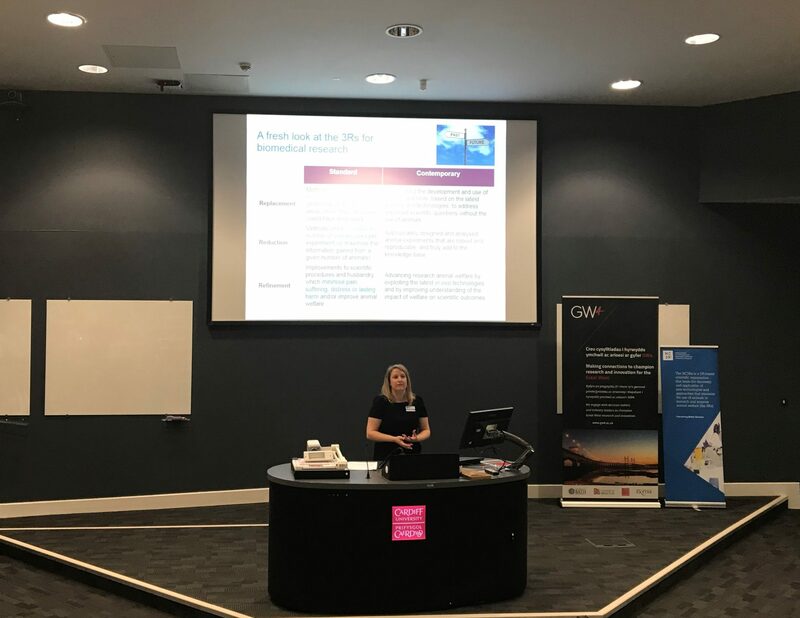 Over 100 delegates attended this popular inaugural event held at Cardiff University, jointly hosted by the NC3Rs (National Centre for the Replacement, Refinement and Reduction of Animals in Research). The symposium provided an opportunity for GW4 institutions to present their 3Rs (replacement, refinement and reduction of animals in research) initiatives with showcase talks from each university (Bath, Bristol, Cardiff and Exeter). Speakers from Cardiff University included Pro-Vice-Chancellor, Professor Gary Baxter who welcomed the attendees. Professor Alastair Sloan, Head of the School of Dentistry spoke about his experiences on both sides of 3Rs research, from a funded scientist to a NC3Rs grant panel member. Dr Stephen Paisey, Pre-Clinical Facilities Manager at the Wales Research and Diagnostic PET Imaging Centre also gave an introduction to in vivo imaging and its potential 3Rs benefits. The plenary talk was delivered by Professor Esther Rodriguez-Villegas from Imperial College London, who spoke about a new product, TaiNi, which provides ultra-lightweight wireless neural recording for increased research output and improved animal welfare. During the event, delegates enjoyed a range of posters as researchers presented their own projects and advances in the 3Rs for the chance to win one of two £100 poster prizes. NC3Rs Director of Science and Technology, Dr Anthony Holmes, provided attendees information about the resources and funding opportunities available from the NC3Rs, in order to support university staff in submitting a competitive application and applying the 3Rs to their work.